Creativity has become part of the language of regeneration experts, urban planners and government policy makers attempting to revive the economic and cultural life of cities in the 21st century. Concepts such as the creative class, the creative industries and bohemian cultural clusters have come to dominate thinking about how creativity can contribute to urban renewal. Spaces of Vernacular Creativity offers a critical perspective on the instrumental use of arts and creative practices for the purposes of urban regeneration or civic boosterism. Several important contributions are brought into one volume to examine the geography of locally embedded forms of arts and creative practice. There has been an explosion of interest in both academic and policy circles in the notion of creativity, and its role in economic development and urban regeneration. 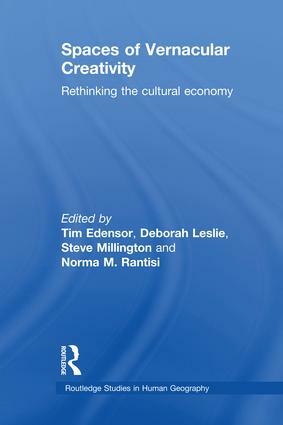 This book argues for a rethinking of what constitutes creativity, foregrounding non-economic values and practices, and the often marginal and everyday spaces in which creativity takes shape. Drawing on a range of geographic contexts including the U.S., Europe, Canada and Australia, the book explores a diverse array of creative practices ranging from art, music, and design to community gardening and anticapitalist resistance. The book examines working class, ethnic and non-elite forms of creativity, and a variety of creative spaces, including rural areas, suburbs and abandoned areas of the city. The authors argue for a broader and more inclusive conception of what constitutes creative practice, advocating for an approach that foregrounds economies of generosity, conviviality and activism. The book also explores the complexities and nuances that connect the local and the global and finally, the book provides a space for valuing alternative, marginal and displaced knowledges. Spaces of Vernacular Creativity provides an important contribution to the debates on the creative class and on the role of value of creative knowledge and skills. The book aims to contribute to contemporary academic debates regarding the development of post-industrial economies and the cognitive cultural economy. It will appeal to a wide range of disciplines including, geography, applied art, planning, cultural studies, sociology and urban studies, plus specialised programmes on creativity and cultural industries at Undergraduate and Postgraduate levels.